This year we have ordered and will publish cryptographic algorithms life cycle report in parts. The first part is now available. The first and the most important chapter gives overview of the current state of algorithms. The second chapter writes about the cryptographic side of the last fall ID card crisis. The report describes what happened, what was done and how on the cryptographic side the new solution (elliptic curves) for ID cards works. The third chapter gives overview of block-chain technologies and in addition provides Estonian-language terminology for block-chain related English terms. 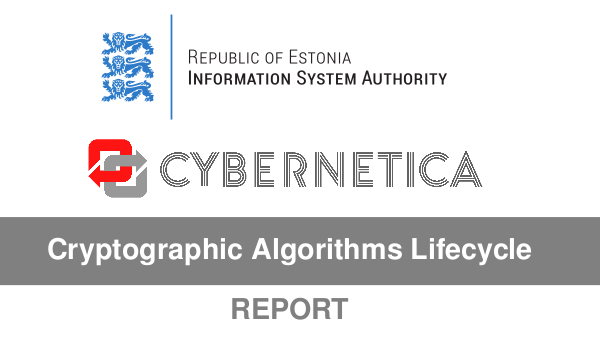 The report has been ordered by RIA and written by Cybernetica researchers Ahto Buldas, Jan Willemson and Arne Ansper. This entry was posted in Cryptography and tagged Ahto Buldas, Arne Ansper, Jan Willemson, Kaur Virunurm, Mari Seeba on April 3, 2018 by user469294. Abstract: After the Estonian Parliamentary Elections held in 2011, an additional verification mechanism was integrated into the i-voting system in order to resist corrupted voting devices [..] However, the verification phase ends by displaying the cast vote in plain form on the verification device. 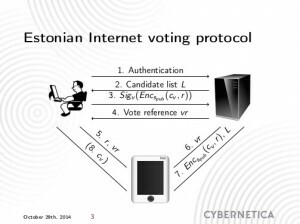 [..] In this respect, we propose an alternative verification mechanism for the Estonian i-voting system to overcome this vulnerability. Abstract: Recently, Muş, Kiraz, Cenk and Sertkaya proposed an improvement over the present Estonian Internet voting vote verification scheme. This paper points to the weaknesses and questionable design choices of the new scheme. We show that the scheme does not fix the vote privacy issue it claims to. It also introduces a way for a malicious voting application to manipulate the vote without being detected by the verification mechanism, hence breaking the cast-as-intended property. In addition, the proposal would seriously harm usability of the Estonian vote verification scheme. TL;DR: Turkish researchers see a privacy risk in the verification process which lets voter’s mobile device to learn for whom the vote was given. Estonian researchers in the counter paper argue why the proposed improvements do not solve the issue, instead decreasing the security of the scheme. This entry was posted in Internet Voting, Research Articles and tagged Isa Sertkaya, Ivo Kubjas, Jan Willemson, Koksal Mus, Mehmet Sabir Kiraz, Murat Cenk, Tiit Pikma on February 22, 2017 by user469294. This report talks about security of NFC/RFID cards. It first describes the most widely-used type of cards, MIFARE Classic, and then considers a real-life application, namely Estonian public transportation cards. The communication between a real card reader installed in Tartu bus and a Tallinn public transportation card is eavesdropped and analysed on high level. The report has been published for the UT course “Research Seminar in Cryptography (MTAT.07.022)”. This entry was posted in Electronic Payments and tagged Jan Willemson, Yauhen Yakimenka on February 15, 2017 by user469294.